Did you know that Logan has its first official food truck? Food trucks are one of the biggest culinary trends right now, and we're in the game! We have been blessed with some taco trucks for a few years. They stake out their spots and always serve out of the same location. But the Street Eats food truck is a true MOBILE restaurant, frequently changing locations throughout Logan and Cache Valley. 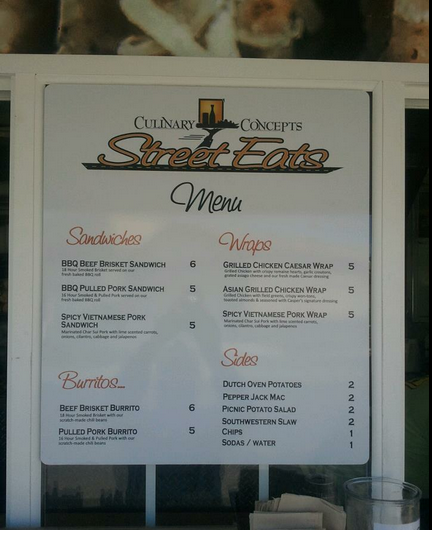 The Street Eats food truck is a project of Culinary Concepts, one of Logan's best caterers. I still remember fondly a meal I ate at their Smithfield restaurant Blue Sage in 2003. They closed the restaurant to focus full-time on catering, and I have enjoyed many of their catered meals over the years. I'm so glad I can eat executive chef John Simpson's food more often now through Street Eats. I got to sample Street Eats' offerings when I had their Spicy Vietnamese Pork Wrap at Summerfest. Here's what I said about it then: " I ordered a Spicy Vietnamese Pork Wrap from Culinary Concepts, which was thinly-sliced pork surrounded by lime-scented carrots and other veggies, as well as herbs and a savory sauce. I added some Sriracha hot sauce, one of my favorite condiments, for the perfect finishing touch. Boy it was a mighty fine sandwich! Probably the freshest, "cleanest" fair food I have ever tasted. It was reasonably priced (as far as fair food goes, which is a notoriously expensive) at $5." Fresh, healthy, flavorful, and priced right! Street Eats will be at ThermoFisher today from 10:30am to 1pm. The address is 1655 South Hyclone Drive, Logan, Utah. Like Street Eats Utah on Facebook for updates and daily locations. Also, follow me on Twitter (@lisabakerheaton) for location updates. Street Eats doesn't seem to have a Twitter account that I can find, so I will try to tweet the locations when I am aware of them. It's hard to follow the happy news of a new dining experience in Cache Valley with the sad news of a restaurant closing, but I have received word that Hamilton's Steak & Seafood, one of Logan's few fine dining restaurants, will close this Saturday, June 30, 2012. The restaurant, which opened in 2004 and is located in a dramatic lodge-style building at 2427 North Main Street, will reopen soon with new owners, a new name, and a new concept and menu. The new owners are reported to be current owner Justin Hamilton's original partners in his other restaurant, Cafe Sabor (located on Center Street and 600 West in Logan). I am interested to see what the new restaurant and menu will be, but I am saddened to lose Hamilton's. Some people say that it is too expensive, or that it has gone downhill, but that hasn't been my experience. I've always had good or great meals there at a good value point, especially at lunch. Many friends have been involved with the restaurant over the years. I'm going to try to make it over there for a meal before the closing. Thanks for the memories (and the raw oyster shooters), Hamilton's! Best wishes to Justin Hamilton in any new endeavors. This isn't actually the first. There are a couple taco trucks in town, 2 BBQ trucks, the Pauni's food truck, and the Gossner's Grilled Cheese truck that actually goes all over the state. They don't all always have a set spot but I know Rollin' West BBQ likes to park in front of Aaron's on main or Sears up on 100 E. Tacos El Ray is all over town. Most of these places have facebook pages where you can track where they are going to be. You're right, Suzanne, that we've had other trucks. I mentioned the taco trucks. I feel like those and the BBQ trucks (which I thought a couple closed?) usually have a set "spot", or only come out at the fairs, but maybe they are open and on the move more than I've realized. Street Eats I meant as being the first to execute the current style of the food truck "trend" a la Chow Truck in SLC, etc., with the diverse menu and frequently changing locations. Thanks for the heads up on the other Facebook pages! I will for sure follow up on this with another post. The taco trucks and bbq truck tend to have 3 or 4 locations they stick with but do move around a bit. One of the BBQ trucks did apparently go out of business. As far as I know the school bus taco truck North of Hamilton's isn't really a mobile operation and is there all the time. We used to have a hot dog stand on Main street that moved around a bit, but they seem to have disappeared. I kind of wish we had more and I'd love to seem them be allowed to set up on campus where I'm sure they'd do great. My friends in D.C. and L.A. wax poetical about their food trucks.